How to make tray icon always visible? Drag the icon using the mouse, from the hidden drop-down list to the visible area near the system clock. This trick works not only for our software, you can easily rearrange visible and hidden icons in the system notification area AKA System Tray. Simple network inventory with Network Asset Tracker Pro. Our software enables you to collect hardware and software inventory data from remote computers with variety of audit methods like agentless and agent-based methods. Network Asset Tracker Pro helps to make network inventory easy and quick. You can track changes in inventory data using history of scans. Using Network Asset Tracker Pro you will have up-to-date hardware information about each workstation on your network. Processor type and frequency; BIOS information and serial number; Motherboard and chassis; Network adapters; Memory size and memory modules; Hard drive, CD/DVD drive; Video card and monitor; Multimedia devices; Printers; Manufacturer; Serial number, etc. 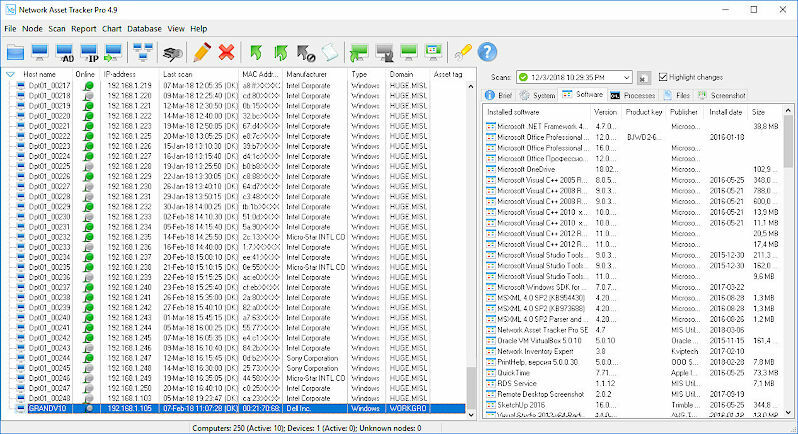 License counting and Software Inventory for all remote computers shows version of software installed on every computer, publisher and registration key. Registration keys are available only for certain software packages. Just apply the necessary filtering to inventory data, and you can easily generate a report on any topic that interests you. You can export reports in HTML, MS Excel, CSV and RTF formats. By using chart builder you can create your own chart and then export it in HTML. Network Asset Tracker Pro works as standard windows application, it's simple network inventory software. There is no need to install any Web Servers or any other complicated systems. What new feature do you want? We are asking our customers what features do they want in the Keyboard LEDs software. You can also participate in discussion on our Facebook page. New computer user monitoring service has been announced by Refog. The solution called Hoverwatch shows what's being done on a phone or computer. It's aimed at caring parents and concerned employers. The web service is available immediately as a free trial or as paid subscription. We have recently received a letter from AtomPark Software a company developing email marketing software and providing email marketing services. The company representative stated, that Keyborad LEDs turned out to be quite a handy piece of software that helps the copyrighters streamline their work. When you type and keep your eyes on the screen, it's quite easy to accidentally press the "CAPS LOCK" button and other buttons of the same type. It's quite distracting if you don't notice this. Keyboard LEDs helped our copyrighters streamline their work and made it more efficient. Accidental key pressings are not a problem now! Keyboard LEDs software does exactly what we need! Thank you! Hopefully, Atompark Software is not the only company who finds our software handy. I was hoping to find something that would indicate my current FLock status (Microsoft Natural 4000 keyboard). This didn't do it. F-Lock state cannot be controlled by software. The only way to detect is F-Lock On or Off is wait until user press some of Fx keys and compare the scan code. Keyboard LEDs 2.7 has been released. Also the memory consumption has been improved. Please download the latest release of our software. Keyboard LEDs 2.5 has been released. OSD sizes are changed to be bigger by default. Tray Icon color is changed to be visible on white background. New Keyboard LEDs 2.3 is released. OSD always fits the screen area and semitransparent by default. Animated OSD disappearing for auto-hide mode added. No more multiple beeps when a lock button is pressed and held. PingNotify™ event tracking restricted to few times per day. Keyboard LEDs 2.1 has been released. Fixed unexpected hiding of the OSD while dragging with mouse. Tray Icon tooltip shows the program version. Fixed UAC elevation of program run from the installer. Perfect remote data recovery over network web site.